INXS were an Australian rock band, formed in 1977 in Sydney, New South Wales. The group disbanded on 11 November 2012. When "The One Thing" came out in 1982, it was a slinky, lascivious song with a killer guitar lick and a lead singer who had mega-star written all over him. By the time their third American release The Swing appeared in 1984, INXS were one of the biggest acts in the world. You couldn't turn on your car radio without Michael Hutchence slithering up to you and panting in your ear. The synth-heavy Pop of their earliest records mutated into a pounding dance-rock with sleazoid Stones-iness and unstoppable, Disco-fied grooves. With the dawning of the Grunge era however, the ersatz funk of INXS became utterly obsolete, and the band sank into relative obscurity until Hutchence's tragic death in 1997. I was lucky to see INXS's Kick tour in the late 80's. My friend was a radio programmer and invited me and a few friends to see them. We went back stage after the show to meet the band, and they enjoyed our company enough to invite us to their hotel rooms and party all night. I have to say that these guys were so laid back and cool, especially Michael. I can't say that about the Cars, because I met them to, and they were the most arrogant sob's you could imagine. I will never forget that night with this band!!! 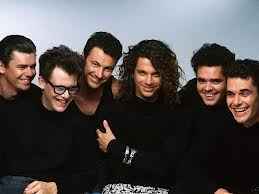 INXS 80'S PERFECTION!!! Right Time..Right Place! 'Our World's Collided And They Can "Never Tear Us Apart'"! Michael Hutchence forever missed & forever in our hearts.